Upper Kerio Valley, Elgeyo-Marakwet, Kenya. 25 December 2014. The ample tail is edged in the same rusty-brown color of the chin, breast and belly. The broad white stripe extends from the beak, over the eye and back to the nape. The bill is powerful enough to penetrate into soil and turf after insects and worms. 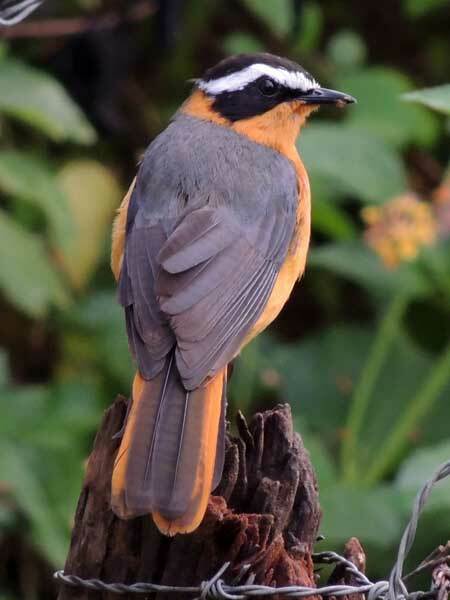 This species is similar to the the Cape Robin-chat, but prefers drier more open habitats at lower elevations. Copyright Michael J. Plagens, page created 13 Nov. 2015.